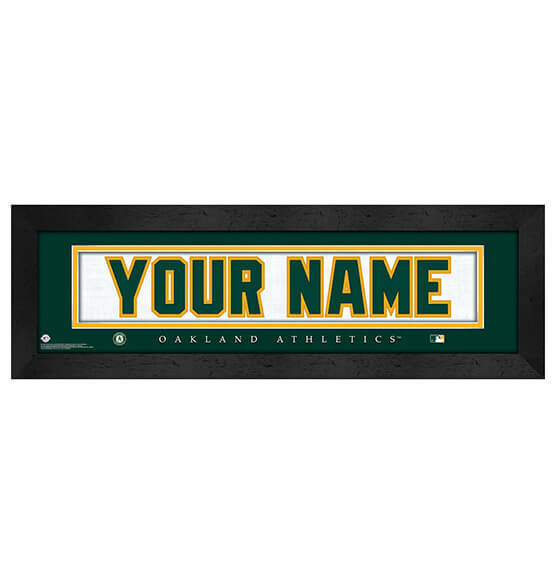 Proudly display your love for Green and Gold with our Oakland Athletics Personalized Nameplate Framed Art decor from PersonalizedThings by Exposures. This officially licensed sports decor is easily customizable up to 12 characters. Whether you create this custom piece for yourself or to give as an epic birthday, holiday or anniversary gift, one thing is sure: This custom nameplate will be a moon shot in any Oakland A's superfan's book! This black-framed wall art features classic green and gold team colors, the team logo and a high-quality printing process designed to look like the back of an A's jersey. This art is easy to hang thanks to the included attached sawtooth hanger.